This is your 3D printed Jewelry, Bracelets! bracelet black panther was made then sold by adriano so you can personalize it, make it as you wish then use it regularly! Choose among more than 75 varied 3D printing components to customize the 3D printing design so it fits your style of living or the use and lifestyle of the person you desire to gift it to. Elect the 3D printing material which fits your personality, the coloration that matchs your humor, the proportion you need your bracelet black panther in and you will receive it 3D printed very directly. Thanks to Sculpteo Marketplace, you are able personalize this concept conceived by adriano and spontaneously get an idea of the way the 3D printed article will look like. If you happen to be in doubt and aren't a 3D printing master yet, we'll also deliver you recommendations to optimize your bracelet black panther and make the most beautiful of the genius adriano place in it to realize a really extraordinary and customized Jewelry, Bracelets. 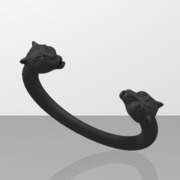 Wheather you wish to obtain bracelet black panther 3D printed for yourself or for someone you will let you to follow it until it reaches you. You could adapt the details of this 3D model and personalize bits to truly obtain a one-of-a-kind object, do not wait to adjoin details and make this 3D printing project more special and fitting your personality. 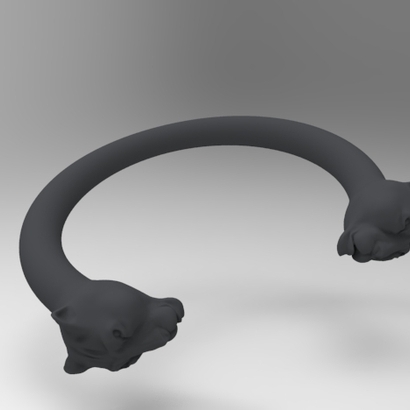 And if you like bracelet black panther, don't omit to examine other 3D models created by adriano to design other amazing 3D printing items!